About 25 years ago I did the house style for a second hand fashion shop of a friend. The shop was named after a comic charcter, Rip Kirby . I made the logo, the posters, the ads and everything else that had to be made. In return I got some cool clothes. This was when in the early years of re-discovering original 50’s and 60’s clothes. Today it has become almost impossible to walk around in original 50’s clothing, but back then it was fairly easy. I have warm memories of some of these clothes, because they were extremely important to me in those days. Anyway, I visited this shop once a week or so, and usually I met all kind of friends there. One day a women asked if I would like going with her to beach concert that afternoon. The beach was not far from the shop, half an hour by bus. And because I had nothing better to do and never seen a late afternoon beach concert, I went with her. I remember asking her what kind music it was, but she didn’t know. All she knew was that a friend of her had lost her contact lenses, and that concert was organised for raising money to buy new ones. I realise how ridiculous this all sounds now, but I didn’t thought to much of it then. I just hoped that it would be a nice afternoon and some cool music. It turned out to be in the middle of the beach, where a group of maybe fifteen young lesbian women had gathered around a girl with primitive electronic organ. I was not very warmly welcomed, but decided to make the best of it. The surrealistic aspect of the whole event appealed to me, and although I could now forget the exciting rock’n’roll concert that I had hoped for, I wanted to witness the party to the end. It took a while before the girl began playing, but from the very moment she opened her mouth I was in trance. She had the voice of an angel, and touched every part of me that I rarely touched myself. She accompanied herself on the organ, which had a toy like rhythm machine, that was in total contrast with the heart breaking voice. If the rest of the company wasn’t what it was, I would have cried all the time. The concert didn’t last long. The lady sang about ten or fifteen songs, some ofwhich I recognised as covers of soul and jazz classics. I asked what the name of the singer was and went home, while the rest stayed partying. 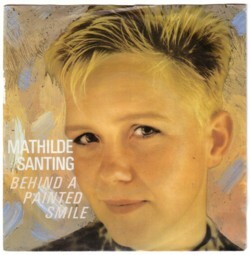 The singer’s name was Mathilde Santing, and she would have an LP out very soon, I was told. The next day I went to a record shop and saw that the LP was already out. It was a 10 inch record, released on Idiot Records, with on the cover a black and white picture of Mathilde, and with seven of the songs on it that I had heard the day before. The songs on the LP sounded exactly as I remembered them. Rather clumsy music and a voice from heaven. I have no idea how often I have played this record, but I do know that my copy didn’t last long. For a while this LP was the only present I bought for people. I just discovered that I still have two extra copies on the shelf. 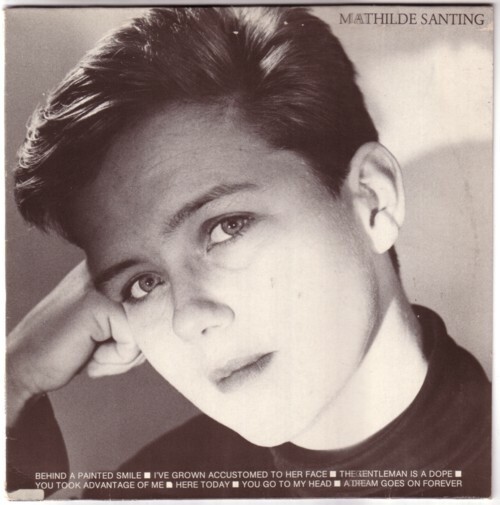 Mathilde Santing is famous now, and I have half a meter of records and CD’s with her music. I will write more about the other recordings that she made, but here is from that first LP a song that still has all the magic in my ears, Behind a painted smile . This song was also released as a 45, with on the B-side a song that was not on the 12 inch LP, but that was on the 12 inch re-issue of the LP. With a little effort these records are still to be found here and there.